The Jewellery Channel has an amazing selection of ruby rings available just in time for Christmas. 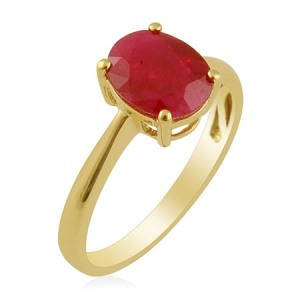 The vibrancy of the ruby gemstone set against gold or silver metal is a colour combination that many cannot resist and our favourite ruby rings from The Jewellery Channel can be seen below. The Jewellery Channel’s ILIANA Burmese Ruby (2.00Ct) 18K Y Gold Ring Size O 2.000 Ct (£549.95) is a spectacular example of how well ruby works with metallic hues. This solitaire ring showcases a rich 2 carat oval cut Burmese ruby that is prong set on a band of yellow gold. This ring is simply stunning and will make the perfect gift this Christmas. Ruby rings are a true favourite when choosing a special engagement ring or anniversary ring. Ruby red is the worldwide colour for love, passion, desire and true friendship. Wearing a vibrant red ruby gemstone will uplift your spirits and makes a dramatic statement on your ring finger that you’ll love to wear and show off to girlfriends when you receive a ruby engagement ring this Christmas. Choosing a solitaire ruby ring offers true meaning to love and passion and ruby rings with diamond accents can represent the past, present and future of your relationship. The choice of stunning Iliana ruby rings from The Jewellery Channel offers beautiful rings for celebrating an anniversary and especially for proposing to your girlfriend or partner this Christmas. Order your rings securely online and enjoy the special moment of giving and receiving your ruby rings so much more. 9K Y Gold Russian Diopside and Diamond Ring 1.33 Ct.
Marropino Morganite (0.71 Ct) and Diamond 9K W Gold Ring (Size O) 1.015 Ct. Platinum Overlay Sterling Silver Russian Diopside Ring Size O 2.000 Ct. Platinum Overlay S S Paraibe Apatite Ring 1.75 Ct.